There was a time, quite a long period of time really, when Dan and I were nearly certain we did not want to have any more children biologically. We were so sure, in fact, that we gave away everything we owned that was baby related. When I say everything, I mean everything. You name it, we don't have it. So here we were, three(ish) months away from our fourth child entering the world, and we didn't have a single thing. I find it kind of amusing, in a way. Two of our friends kindly offered to throw us a baby shower. This meant so much to me. It really did. However, not only am I missing the bridal/shower gene, but it feels really unfair to ask other people to buy things for us when we made the decision to a) give everything away and then b) have another baby. The great thing about babies is that they really don't need much. 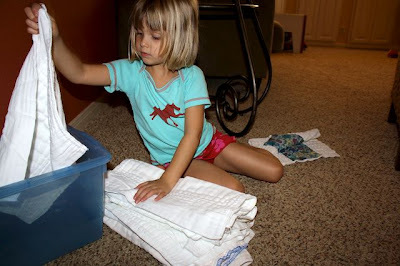 Around here I found just over a dozen prefold diapers that I had saved to be used as cleaning rags someday. 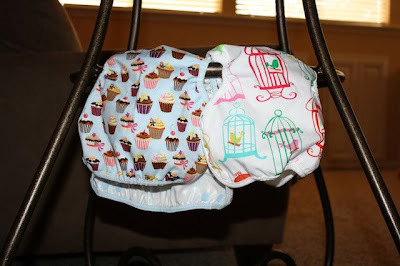 I gave my fancy diaper stash away a year or so ago. But, interestingly, after trying an assortment of more expensive diapers made from various natural fibers, I found that I liked these cotton prefolds the best anyway. I ordered a couple of American-made diaper covers here. I found this baby hammock, new, still in the box on Ebay for $50. (It retails for around $240 here). I worried that this might be a little too good to be true, but it came today and was in perfect condition. We're hoping that the hammock will replace our co-sleeper and possibly our swing as well. 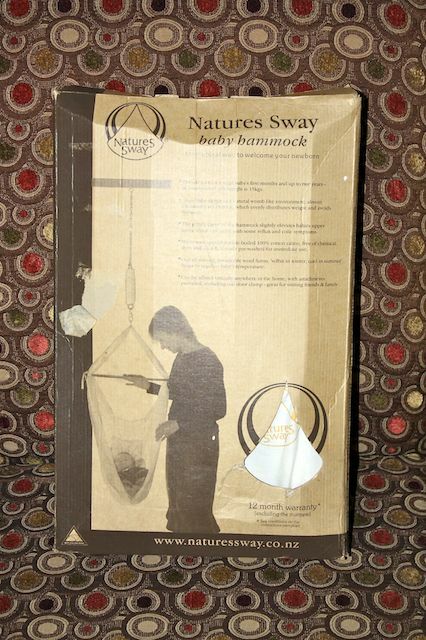 Our bio babies would having nothing to do with sleeping on flat surfaces - only on us, with us, or in a swing. I've read it may not be good to let babies sleep in the traditional infant swings because of the degree of the incline. If the hammock doesn't work out, there are plenty of papasan-style swings (less incline) at our local resale shops. Last weekend, Indigo and I hit the thrift shop scene looking for baby clothes because again, we had not a single thing. She and Jude both needed a few things as well. After several unsuccessful stops, we hit the jackpot. Indigo has been my right-hand girl in baby preparations and I couldn't have asked for a better thrifting partner. She'd stop to point out how sweet a sleeper was or how tiny a onesie was or how the baby would absolutely love a certain dress. We still need a car seat, a sling or two, and a few more baby clothes. But we're getting closer. And the fact that the older kids really 'get it' this time around has made it a lot of fun. 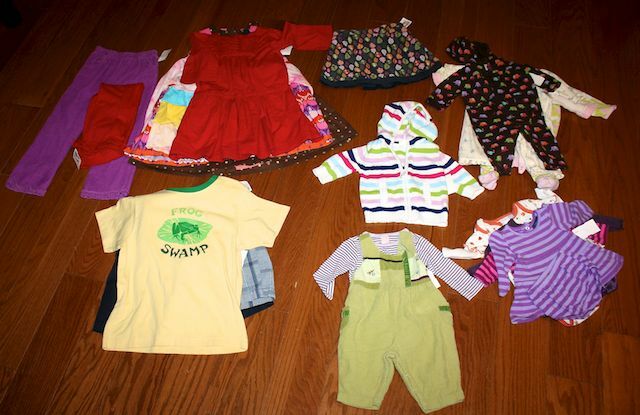 Wow You did hit the jack pot on the baby clothes. NICE! Glad you are finding some things to make you feel more prepared! I have yet to install our car seat...it has been too hot or stormy to bother with it! But, I did manage to freeze a ton of stuff over the past few days. Hopefully this weekend the car seat will be in! I don't have much more time!